Are you looking for a way to encourage your children to read more this summer? The Raymond Village Library is here to help. Children of all ages are welcome to join Raymond Village Library’s Summer Reading Program. This year’s theme is music, and the library is hosting special events the entire month of July to celebrate. Stop by to sign up for the program and receive a bag with a monthly calendar of all the library’s special events, two Seadogs tickets, a bookmark, a reading tally sheet, and a whistle. 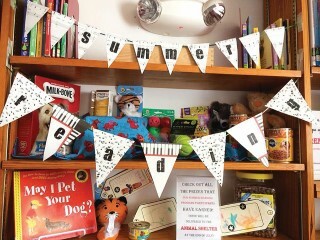 This summer, the Raymond Village Library has partnered with local animal shelters to offer special rewards to young readers. Children who join the reading program are able to set their own goals by planning on reading, or being read to, a certain number of minutes per week or a certain number of books per week. The readers, or their parents, keep track of books or minutes read on the tally sheet. Each time the readers meet their goal, they’ll be given the chance to win a special prize for a cat or dog. Prizes of cat and dog toys, treats, and food are on display in the children’s section of the Raymond Library. When a young reader completes their goal for the week, they have the chance to decorate a special gift tag with their name, select a prize for the shelter animals and move the tagged prize to a separate shelf. At the end of the summer, all the “prizes” will be delivered to the animal shelters with the children's tags attached. This summer, the more kids read, the happier local dogs and cats will be! Stop by the Raymond Village Library for your chance to support your local animal shelter, read great books, and have fun at your library this summer.